Oil well cementing is an important process of drilling and completion operation. The cement slurry is placed between the casing and the drilled formation for adequate zonal isolation for the lifetime of the well . Cementing operation is generally classified into two categories as primary cementing and remedial cementing. Primary cementing is carried out immediately after drilling a section of a wellbore to hold casing and to isolate the formation from the wellbore. The design of primary cement slurry must be done with at most care as the lifetime of the well is primarily determined by the quality of primary cementing. Additives for this process should be selected based on several factors such as the well profile, temperature, pressure, acid-gas, etc. The designed cement slurry is pumped down and placed between casing and the geological formation. The set time is determined by the type of retarder and accelerator added in the slurry. The primary objective of having the primary cementing is to provide support and bond casing, zonal isolation to prevent fluid migration between formations, protect casing from corrosive environment, to act as a seal and a barrier to hold formation pressure and to provide protection for casing from drilling operations such as shock loads. Casing points and cementing stages are usually included in the well design itself. Therefore, the driller is always aware of the fact that the drilling must be phased for casing and cementing. However, there are situations where casing and cementing job becomes necessary to address a specific drilling problem such as lost circulation. A successful cementing practices start with the design of effective cement slurries by adding additives to enhance or modify to achieve desired cement properties . The additives added in cement are an integral part of the well design, construction and integrity. Therefore, a through lab testing must be carried for any new cement design or additive before applied the cement slurry in the field. The lab testing includes compression test using UCA, setting time, etc. There are several additives included in the cement design for specific applications. It is not possible to define a general guideline for all situations for the concentration of additives required for the cementing job . There are no standard guidelines to help drilling engineers and scientists in the effective design of optimal cement slurries to be used in different well sections. The selection of additives for cement design is based on the formation type, depth, temperature and pressure. Apart from commonly used additives for applications such as rheology, fluid loss control, and as retarders, specialty additives such as extenders, thinners, gas migration prevention additives, H2S scavengers, Oxygen scavengers, corrosion inhibitors, expansion additives, etc., should be added depending on the well requirement . Proper design of cement slurry specific to a job will sometimes exclude the addition of expensive chemicals that are not required for that specific job thereby minimize cementing costs. From common practice, it is known that cementing slurries should be tested in advance, since each particular well has distinctive characteristics. Therefore, Field and lab experience are required for cementing specialists to help drilling engineers when designing cement slurries. There is no comparative study that provides the performance guidelines and limitations of different chemicals used in cementing. This review article aims to provide details about cement chemistry and chemicals used in cementing oil and gas wells and their mechanisms of actions. It is the process of placing a cement slurry between a casing or liner string and the drilled formation. The main objectives of this operations is to include zonal isolation to prevent migration of fluids in the annulus, support for the casing or liner string, and protection of the casing string from corrosive formation fluids. The cement slurries are routinely designed for temperatures ranging from below freezing in permafrost zones to 700°F in geothermal and thermal recovery wells with pressure ranging from near ambient in shallow wells to well over 30000 psi in deep wells. Besides temperature and pressure, other factors such as porous formation, corrosive fluid environment and over pressured formation fluids must be taken for consideration in primary cement design. Only by having adequate additives incorporated in cement slurry design, such a wide range of conditions could be accommodated. Additives allow the cement for easy and successful placement, rapid compressive strength and provide zonal isolation for the lifetime of the well. Following abbreviations have been used to simplify the expression of different cement chemical constituents. The Portland cement in general is mainly composed of four components namely tricalcium silicate (C3S) responsible for the early strength development, dicalcium silicate (C2S) responsible for the final strength, tricalcium aluminate (C3A) and tetracalcium alumina ferrite (C4AF) for early strength. In addition, gypsum is added to control the setting time of cement . The silicates phases contribute about 75-80% of the total cement material with C3S being the major constituent (60-65%). The quantity of C2S normally does not exceed 20% (except for retarded cements). Upon hydration, the C3S and C2S produce calcium silicate hydrate (C3S2H) and calcium hydroxide (Ca(OH)2), also known as Portlandite. The C3S2H3 is commonly called as CSH gel and it has variable C:S and H:S ratio depending on the temperature, calcium concentration in the aqueous phase and curing time. The CSH gel comprises around 70% of fully hydrated Portland cement at ambient conditions and is considered the principal binder of hardened cement. In contrast, the calcium hydroxide is highly crystalline with concertation of about 15-20% and is the reason for the high pH of cement . In contact with water, the gypsum partially dissolves releasing calcium and sulphate ions to react with the aluminate and hydroxyl ions produced by the C3A to form a calcium tri-sulphoaluminate hydrate, known as the mineral ettringite, (C3A.C3S.32H) that will precipitate onto the C3A surfaces preventing further rapid hydration (flash-set). The gypsum is gradually consumed and ettringite continues to precipitate until the gypsum is consumed. The sulphate ion concentration will be dropped down and the ettringite will become unstable converting to calcium mono-sulphoaluminate hydrate. The remaining un-hydrated C3A will form calcium aluminate hydrate. Special additives are included in cement design to alter or inhibit the hydration reaction . For a same slurry design, a wide spectrum of results could be obtained depending on parameters such as particle size distribution, silicate and aluminate phase distribution, reactivity of hydrating phases, gypsum/hemihydrate ratio, total sulfate content, free alkali content, temperature, pressure, additives concentration, mixing energy, order of mixing and water-to-cement ratio. Due to the complexity of cement hydration process and the influence of large number of parameters, a thorough laboratory testing should be carried out prior to wellsite application to avoid any unpleasant surprises. There are more than hundred additives available in the market in the form of liquid and solid to fulfil the eight main categories of application. These are the type of chemicals that reduces the setting time of a cement system and increases the rate of compressive strength development. Accelerators are used sometimes for conductor pipes or at low temperature where short thickening time is desired. They are also often used to counterbalance the set delay caused by certain other additives such as dispersants and fluid loss control additives . Many inorganic salts can act as accelerators for Portland cement. Accelerating function is also known for many other salts such as carbonates, silicates, aluminates, nitrates, sulfates, thiosulfates and bases such as hydroxides of sodium, potassium and ammonium ions. Chlorides are the best and accelerating becomes stronger by moving from monovalent to divalent to trivalent cations paired with chloride ion as the radius of the cation increases . The ranking based on the efficiency of accelerating by cations and anions for Portland cement reported by Edwards and Angstadt, 1996 is given below. One of the well-known and commonly used accelerator is calcium chloride in its solid form (77% pure CaCl2). Calcium chloride is used in concentrations ranging from 1 to 4% by weight of cement (BWOC). For concentrations above 6% BWOC, results becomes erroneous and may result in premature setting. The mechanism of action of calcium chloride is very complex and still not clearly explained although several hypothesis have been made in the literature. The hydration rate of cement when mixed with water can be controlled using chemicals . Traetteberg and Bensted reported that calcium chloride increases the hydration rate of the aluminate/gypsum system . The chloride ions increases the formation of ettringite, which is in crystalline needle shape and helps rapid set of the cement slurry. Another explanation is that the calcium chloride changes the morphology of the C-S-H gel structure to a more flocculated form that would enhance diffusion and accelerate hydration, which will lead to rapid setting . Kondo et al. explained that the diffusion of chloride ions into C-S-H gel layer causes counter diffusion of hydroxyl ions to balance charges. This leads to the precipitation of portlandite, ending induction period and accelerate setting. The effect of calcium chloride sometimes is not beneficial if it is not used judiciously. The presence of calcium chloride increases the rate of heat generation during cement slurry mixing and continues to generate heat during the initial hours even after placement. The heat may dissipate to casing and due to the difference in coefficient of thermal expansion, the casing may shrink away from cement leading to thermal micro annulus and zonal isolation is compromised . Other parameters such as rheology, compressive strength development, permeability of the set cement and sulfate resistance are affected or altered for calcium chloride accelerated systems. Sodium chloride can be used as an accelerator at concentrations up to 10%. Between 10 - 18% by weight of water (BWOW), it is essentially neutral, and thickening times are similar to those obtained with fresh water. The addition of NaCl above 18% BWOW causes retardation. The optimum concentration for acceleration is between 3-5% BWOW. Organic accelerators such as calcium formate, oxalic acid and triethanolamine are reported in the literature although still not widely used for field application . Retarders are chemicals which extend the setting time of a cement system . The mechanism of retardation process is still not well explained although there are several theories proposed in the literature. Chemical nature of the retarder and the cement phase must be considered as the two principal factors upon which retarder acts. For a well whose temperature is about 125ºF or less, we do not need to add any retarders . However, as temperature increases, the hydration process of C3S increases and, hence, the thickening time decreases . Therefore, retarders must be a part of cement slurry design in prevent pre-mature setting in high temperature environment . In addition to retarder additives which are added to cement while mixing cement slurry, there are retarded cements are available in the market. Four principal theory of retarder action have been proposed namely adsorption, precipitation, nucleation and complexation. As per adsorption theory, the retardation is due to the adsorption of the retarder onto the surface of the hydration products resulting in inhibiting the contact with water. In precipitation theory, the retarder reacts with calcium or hydroxide ions in the aqueous phase forming an insoluble and impermeable layer around the cement particles. In nucleation theory, the retarder adsorbs on the nuclei of the hydration product and acts as a poison and prevent further growth. In complexation theory, the calcium ions are chelated with the retarder, preventing the formation of nuclei. The retarder could work in these four ways simultaneously. The nature of the chemical for retardation process is very well developed and summarized in the following section. Sodium and calcium salts of lignosulfonates as shown in Figure 1 are the most regularly used retarders for oil well cementing. These are unrefined wood polymers with various amount of saccharide compounds. The typical molecular weight would be from 20000 to 30000. The presence of low molecular weight carbohydrate is attributed to the retardation function of the lignosulfonates . For effective retardation function, the recommended loading is ranging from 01-1.5% BWOC. Lignosulfonates affect the kinetics of C3S hydration by the combination of adsorption and nucleation theories. 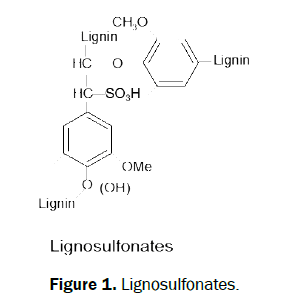 Another explanation for retardation function of lignosulfonate is change in morphology of C-S-H gel structure upon adsorption of lignosulfonate forming an impermeable layer thereby preventing further hydration . Calcium lignosulfonate also contributes in controlling fluid loss . 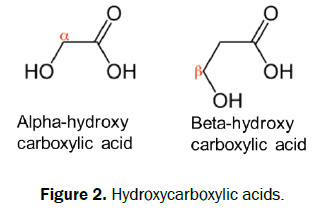 The retarding function of these acids and their salts generally attributed to the presence of alpha or beta hydroxycarboxylic acid groups as shown in Figure 2. These functionality is capable of undergo chelation with metal ions such as calcium and form a stable ring structure, which partially adsorbed on the hydrated cement surface and poison nucleation sites of hydration products. Gluconate and glucoheptonate salts are the most commonly used retarders. Citric acid is also used as retardants and it is also effective as cement dispersants. The best retarders in this category are those containing five membered ring structure such as sucrose and raffinose as shown in Figure 3 . However due to the high sensitivity to small variations in concentration, these are not commonly used in well cementing . It has been reported that the retardation function depends on the susceptibility of these compounds towards alkali hydrolysis inhibiting the hydration by poisoning the nucleation sites . These are polysaccharides derived from wood and are stable under basic conditions of cement slurry. The mechanism of retardation is believed to be the adsorption of these cellulose products on the hydrated cement surface and prevent further hydration. The ethylene oxide links and carboxyl groups present in cellulose are the active sites and are responsible for adsorption. 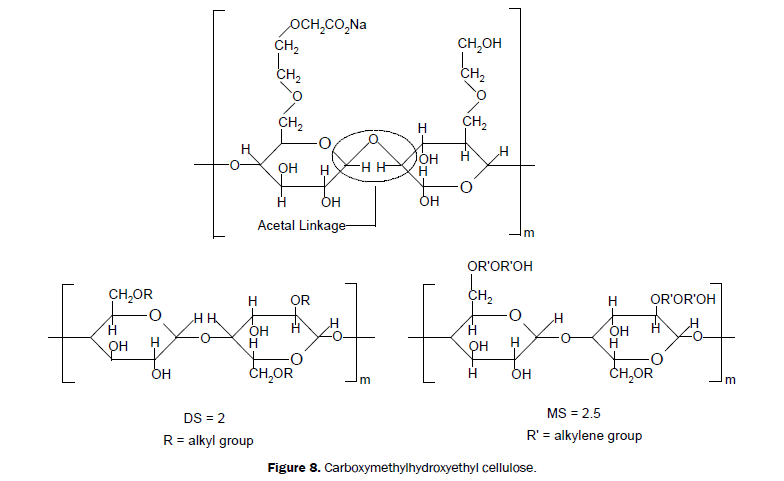 The most common cellulosic material used as retarder is carboxy-methyl-hydroxy-ehtyl-cellulose as shown in Figure 4 . It is often used as fluid loss control additive in cement. 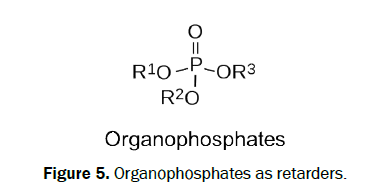 The insensitivity of organophosphates having general formula shown in Figure 5 to small variations in cement composition is an advantageous property of these compounds as retarders. Alkylene phosphonic acids and their salts have been reported as retarders for oil well cementing. These compounds show excellent hydrolytic stability and are effective for bottom hole temperature as high as 400°F . Phosphomethylated compounds having quaternary ammonium salts are also very effective retarders . Although very little has been reported about the mechanism of retardation, it is believed that similar to other class of retarders the poisoning of active nuclei by adsorption is the reason for retarding setting time. Figure 5: Organophosphates as retarders. Other inorganic acids such as boric acid, phosphoric acid, hydrofluoric acid and chromic acid as well as their salts are capable of retard hydration of Portland cement. Oxides of zinc and lead are also used as retarders for thixotropic cement slurries. Sodium chloride with concentration more than 20% BWOW has also been used as cement retarder. Apart from retarders, there are some chemicals used as retarder aid such as sodium tetraborate decahydrate. It has the ability to extend the temperature limit of lignosulfonate to 600°F. However, the efficiency of cellulosic and polyamine fluid loss additives will be deterred by addition of sodium tetraborate decahydrate. Extenders are the materials which lower the density of a cement system or lower the quantity of cement per unit volume of set product. In other words, the cement extenders are used to reduce slurry density and/or increase slurry yield. Reduction of cement slurry density decreases the hydrostatic pressure while cementing weak and depleted sections  thereby minimizing the number of cementing stages and minimizing the chances of induced lost circulation in weak formations. By increasing slurry yield, the quantity of cement used is lowered, which is economically beneficial. Reduction of slurry density leads to lowering compressing strength  and increasing the thickening time . An experimental studies carried out by Salam et al., demonstrates the relationship between extender and thickening time. Depending on the mechanism of action extenders can be classified as water extender where the presence of clays and other water viscosifying agents allow the addition of excess water to achieve slurry extension, low density aggregates where the densities of the materials are lower than that of Portland cement and gaseous extenders where nitrogen or air can be used to form foamed cement with incredibly low density. However, dilution of cement slurry with water thereby reducing viscosity will have several disadvantages such as increase in water to cement ratio, prolonged thickening time, and reduction in compressive strength. Therefore, dilution of cement slurry with water is not a best practice . There are several additives used as extender as summarized in the following. Bentonite is the most frequently used clay extender . It contains 85% smectite, which is composed of two flat sheets of tetrahedral silica sandwiching one sheet of octahedral alumina. Bentonite expands several times when placed in water resulting in higher viscosity, gel strength and solids suspending capacity. Pre-hydrated bentonite is favored because the calcium ions present in cement will prevent the hydration of bentonite. Therefore, for bentonite to act as good extender pre-hydration is recommended. However, the compressive strength is compromised when using bentonite as an extender making the cement slurry not suitable for sulfate waters and corrosive fluids. Bentonite also contributes in fluid loss control. Bentonite is not effective in saline cement slurries. Attapulgite can be used in place of bentonite in such circumstances . Sodium silicates are most commonly used extenders and are available in solid and liquid form. Silicates react with calcium chloride or lime to form calcium silicate gel that provides sufficient viscosity. Therefore, large quantities of mix water can be used without having excessive free water separation. The silicates tend to accelerate setting thereby affecting the effectiveness of other additives such as retarders and fluid-loss agents. The addition of calcium chloride to the mixture of cement and sodium silicate in fresh water triggers the formation of gel. The ideal concentration of sodium silicate is from 0.2% to 3% BWOC. In the case of liquid sodium silicate also known as water glass, it is added in concentrations ranging from 0.2 to 0.6 gal/sk to the mix water prior to be mixed with slurry. If the slurry design includes calcium chloride, then it must added to the mix water prior to water glass to provide sufficient extending properties. For solid sodium meta silicates, it is usually dry-blended with cement in the concentrations ranging from 0.1% to 4% and used for temperatures up to 200°F . Pozzolans are finely-ground siliceous and aluminous materials that obtained naturally are known as volcanic ash and diatomaceous earth and synthetic pozzolans are known as fly ash obtained from coal burning power stations. They can be used to reduce cement slurry density and permeability. They also improve compressive strength by reaction with the free Ca(OH)2 from cement hydration to form stable strong calcium mono-silicate . In addition to that, fly ash are used in cement systems containing silica flour or micro silica to prevent CO2 and sulphate attack. Lightweight particles extenders are inert materials present in cement slurry that have low density as compared to cement particles and used to reduce density of the cement slurry. Perlite, gilsonite, powdered coal and glass microspheres are some examples of lightweight particles used as extenders . Perlite is a crushed volcanic glass containing 76% silica. It can be used in combination with bentonite (2-4%) to prepare low density slurries. However, it has poor compressive strength with low crushing pressure rating of 3000 psi. Therefore, the application of perlite is limited as lightweight cement extender to only shallow section casings. Gilsonite is a naturally occurring asphaltite material and used to formulate low density high compressive strength slurries. Gilsonite will melt at temperatures above 300°F, therefore it cannot be used at temperatures beyond this limit. Gilsonite can also act as lost circulation material and can be used with bentonite for enhanced performance. Powdered coal has very similar performance as Gilsonite as it can be used as extender as well as lost circulation material. One added advantage of powdered coal over Gilsonite is that the melting point of the former is 1000°F making it useful for high temperature applications. Microspheres are recent development in the field of light weight cement. The specific gravity of microspheres is around 0.4-0.6, which allows the preparation of high compressive strength low density cement slurry. Microspheres are made either from glass or ceramic. The glass microspheres in most cases can withstand pressures up to 5000 psi, however special grades are available in the market with thicker walls which can survive 10000 psi over burden pressure. The shell of ceramic microspheres are made of aluminosilicates with mixture of CO2 and N2 gases inside the sphere and are not recommended to use for hydrostatic pressure over 4500 psi. Foamed cement is a system where nitrogen gas is incorporated into the slurry to reduce the density per unit volume. The system requires a specially formulated base cement system to achieve homogeneous slurry that can provide high compressive strength, low permeability and density as low as 7 ppg. 001. Heavy weight or higher density additives are added to cement slurry to increase the overall density of the cement system. The main requirements of additives to be used in as weighting agents include higher specific gravity than the cement, consistent particle size distribution, chemically inert and do not interfere with cement and logging tools . Mud densities of 18 ppg are quite common in high pore pressure, unstable wellbores and deformable formations as a way of stabilizing by providing high hydrostatic pressure. An equal or higher cement systems should be used in such cases. To achieve high density, like in drilling fluid, materials with high specific gravity such as ilmenite (FeTiO3), hematite (Fe2O3) and barite (BaSO4) are added to the cement slurry. Ilmenite has specific gravity of 4.45 and slurry densities more than 20 ppg can be formulated. It contributes very little to thickening time and compressive strength development. Hematite is heavier than ilmenite with specific gravity of 4.95 and appears as red crystalline solids available with fine particle size distribution. It can be used in place of barite to overcome the limitations of barite . It is used make cement slurries having density as high as 22 ppg. Barite is the most common weighting material for drilling fluid however not in cement as it requires additional water to be effective as a densifier. This results in decrease in compressive strength of set cement. These are the chemicals help to reduce the viscosity of the cement. The density of a cement slurry is a direct function of solid content present in the slurry. The surface charges of the particles determine the particle interactions. Cement dispersants changes the surface charges of the particles to obtain desired rheological property. Sulfonate polymers are the most frequently used dispersant with 5-50 sulfonate units attached on the back bone of a highly branched polymer. Linear polymers and small organic compounds carrying negative groups are also effective as dispersants. Polymelamine sulfonate is one of the dispersants used in oil well cementing with temperature less than 185°F as the structure becomes unstable above this temperature. For proper dispersion of cement 0.4% BWOC is required. Polynaphthalene sulfonates are polymers with molecular weight ranging from 3000 to 20000 . These polymers are another commonly used dispersant with concentrations of 0.5% to 1.5% BWOC for fresh water slurries and concentration as high as 4% BWOC as cement slurry prepared using NaCl brine. Anionic dispersants such as lignosulfonates with carboxylate groups will work by adsorption on to the cement surface and make them negatively charged. Therefore, the electrostatic repulsion of negatively charged particles will lead to effective dispersion . Acetone formaldehyde sulfite (AFS) as shown in Figure 6 is a star shaped polymer and will resist coiling up in high brine environment and kept adsorbed on the cement surface. It is very effective at high temperatures and high brine environments. Polycarboxylates such as methacrylic acid-methacrylic ester co-polymer works as an effective dispersant by both electrostatic repulsion and steric hindrance. Figure 6: Chemical additives used as dispersants. These are the materials that minimize the loss of aqueous phase of the cement into the formation and if not controlled properly this may lead to job failure as the volume of the aqueous phase decreases causing increase in density leading to deviation of properties from original design. Dynamic fluid loss is the loss of fluid from the slurry while pumping operations results in an increase in slurry density which may result in induced lost circulation. In addition, other properties such as rheology and thickening time may be affected. Static fluid loss is the loss of fluid from the slurry after pumping and placement and if not controlled, will result in a slurry volume reduction and drop in pressure that may allow formation fluids to enter the slurry . Loss of fluid may allow the gas to get into cement slurry in the annulus. Therefore, filtration control agents are also used to reduce gas migration. Fluid loss control agents are used to minimize fluid loss by creating filter cake of cement slurry on the surface of the formation. Fluid loss control additives reduces the filtration of the fluid by increasing the viscosity of the slurry and decreasing the permeability of the filter cake thereby protecting water-sensitive formation. In addition, the fluid loss control additives also minimize the formation damage and improves bonding and squeeze cementing . Particulate materials and water soluble polymers are used as fluid loss control additives. Examples of particulate materials are bentonite, carbonate powder, asphaltenes, thermoplastic resins, etc. These particles because of their shape and size can enter the filter cake and lodge between the cement particles thereby reducing the permeability. Latex additives also show excellent fluid loss control properties. The most common latex samples used for low temperature applications up to 122°F are vinylidene chloride, polyvinylacetate and recently developed styrene-butadiene is used for high temperature applications (350F). Water soluble polymers operate by increasing the viscosity and reducing the filter cake permeability. Cement fluid loss additives can be non-ionic cellulose-derivate such as HEC, non-ionic synthetic polymers such as PVA or PEI, anionic synthetic polymers such as AMPS-copolymers, or Lattices. Bentonite can also be used for moderate fluid loss control (200-400 cc / 30 min). It can be also used as a viscosifier in the cement slurry and can cause some retardation effect. Carboxymethylcellulose (CMC) is used in drilling muds. However, it is not applicable in cement since it can precipitate calcium ions. Hydroxyethyl cellulose (HEC) as shown in Figure 7 is non-ionic polymer. It increases the viscosity of water by binding the water molecules via hydrogen bridge bonds. HEC is limited to 220°F (104°C) and lose their efficiency as sodium chloride content increases. HEC also has some retardation effect on cement. 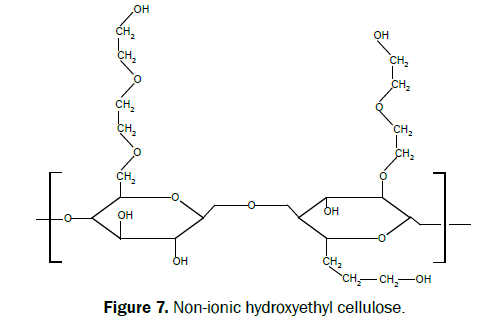 Figure 7: Non-ionic hydroxyethyl cellulose. For higher temperature applications of up to 325°F, carboxymethylhydroxyethylcellulose (CMHEC) as shown in Figure 8 can be used. CMHEC shows tolerance to salt and also cause some retardation effect. A disadvantage shared by all cellulosic polymers is that they are also effective viscosifiers which make the slurry mixing difficult and ultimately cause undesired viscosification of the cement slurry. As temperatures go below 150°F, most of the cellulosic based fluid loss additives will cause retardation of cement setting. On the other hand, the efficiency of fluid loss control of cellulosic polymer decreases as temperature increases. Therefore, a care must be taken while choosing cellulosic polymers to avoid undesired results. 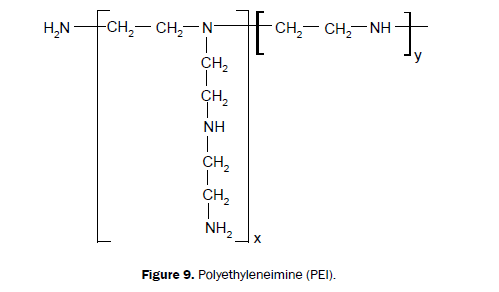 Polyethylene mine (PEI) as shown in Figure 9 are a type of fluid loss additives that has high thermal stability and will perform up to 390°F in brines up to 3% BWOW. The performance of PEI increases when used in combination with anionic dispersant to produce insoluble agglomerates. PEI works by plugging filter cake and not recommended to use in offshore jobs as it is considered to be toxic to marine life . Polyvinyl alcohol (PVA) can be used for up to 280°F in low concentration brines with no retardation effect (Figure 10). However, when cross-linked with boric acid, an increase in fluid loss and some retardation effect will take place. 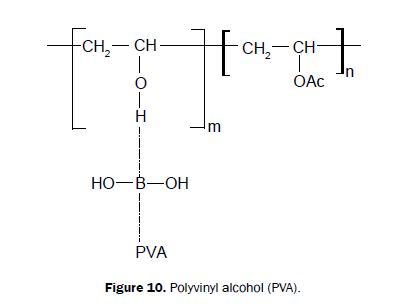 Figure 10: Polyvinyl alcohol (PVA). Styrene-Butadiene resin lattices (SBR) shown in Figure 11 will enhance the bonding and aid in the prevention of annular gas for up to 350°F. Figure 11: Styrene-Butadiene resin lattices (SBR). Synthetic AMPS-based copolymers such as 2-acrylamido-2-methylpropane sulfonic acid (AMPS)-co- acrylic acid (AA) acrylamide (AAM)-co- N-methyl-N-vinylacetamide (NMVA) are very effective fluid loss additive for up to 225°C (Figure 12). The AMPS-based copolymer results in high viscosity and has limited compatibility with other additives. The AAM will hydrolyze to AA at high temperature causing some retardation effect . Figure 12: 2-acrylamido-2-methylpropane sulfonic acid (AMPS)-co- acrylic acid (AA) acrylamide (AAm)-co- N-methyl-N-vinylacetamide (NMVA). 2-acrylamido-2-methylpropane sulfonic acid (AMPS)-co- acrylic acid (AA) acrylamide (AAm)-co- N-methyl-N-vinylacetamide (NMVA)-co-vinyl phosphonic acid (VPA) fluid loss additive is effective for up to 400°F and in high salt cement slurries except when using CaCl2 salt as in Figure 13. It will give low viscosity and little retardation effect. It can aid in gas prevention control by helping in developing high gel strength development and right angle setting. The anionic charge density is the lowest for SO3- and highest for PO32-. This means the best performance as cement dispersant will be the one that has the VPA . Figure 13: 2-acrylamido-2-methylpropane sulfonic acid (AMPS)-co- acrylic acid (AA) acrylamide (AAm)-co- N-methyl-N-vinylacetamide (NMVA)-covinyl phosphonic acid (VPA). High molecular weight polyethylenemine (50% active) polymer in water is classified as a cationic fluid-loss control agent. PNS-type dispersants must be used to give significant fluid-loss control. If used alone then no fluid loss control can be achieved. Table 1 shows the recommended fluid loss requirements for different types of operations. Table 1. Recommended fluid loss requirements for different types of operations. These materials are used to control the loss of cement slurry into weak and vugular formations. Lost circulation during primary cementing operation is a serious concern and can result in doing a remedial cementing. The criteria for an effective lost control materials are low-cost, non-toxic, broad particle size distribution, no acceleration or retardation tendency, sufficient strength to bridge the pores and fractures . Organic lost circulation materials used while drilling to control losses are not an ideal choice for controlling losses while cementing. They may be very effective in controlling losses but over a period of time, the organic matter will get carbonized leaving fractures for corrosive formation fluids . Bridging materials are added in the cement slurry which can bridge across fractures and seal of weak zones. Granular gilsonite and coal are excellent bridging agents as they are chemically inert to cement hydration. Other examples include ground walnut or pecan shells, coarse bentonite and also corn cobs. Nylon and cellophane are also used respectively as fibrous and flake type lost circulation material . Cellophane flakes form a mat like structure on the surface of the fracture when the slurry enters the loss zone. Thixotropic cements also can be used for the application of lost circulation as the cement slurry enters the fracture the viscosity increases to a gel consistency as there are no shear or agitation. Eventually, the lost circulation zone is plugged. Calcium sulfate hemihydrate (CaSO4.0.5H20) additive is used to prepare thixotropic slurries. It will form gypsum (CaSO4.2H20) when added to cement and water, which then reacts with tricalcium aluminate to form a calcium sulphoaluminate hydrate mineral (ETTRINGITE) gel. This gel requires agitation to break down. Once agitation is stopped, the slurry gels again. The recommenced concertation of calcium sulfate hemihydrate is 8-12% BWOC and the cement should not contain less than 5% C3A. So, Class G is not recommended to be used here since it has less than 5% C3A where we will not have enough ettringite to form the thixotropic cement. For such type of cement with less than 5% C3A, it is recommended to use a blend of aluminium and ferrous sulphates and sulphuric acid to react with calcium hydroxide in the cement slurry to form ettringite. Foaming can develop while mixing as many cement additives can contribute to foaming. Excessive foaming can have several undesirable properties of cement slurry such as slurry gelation and cavitation in the mixing system with loss of hydraulic pressure. If slurry foams during mixing that may lead to air lock in centrifugal pump resulted in cessation of pumping . Antifoam agents are usually added to mix water or cement dry blend to prevent the above issues . Antifoaming agents are working by changing the surface tension and the dispersibility of the solids thereby preventing the conditions to generate foam. Antifoaming agents should be insoluble and should have lower surface tension than the foaming system. There are two class of anti-foaming agents commonly used such as polyglycol ethers and silicones. A very small quantities of antifoaming agents with concentration as low as 0.1% are required to be effective. 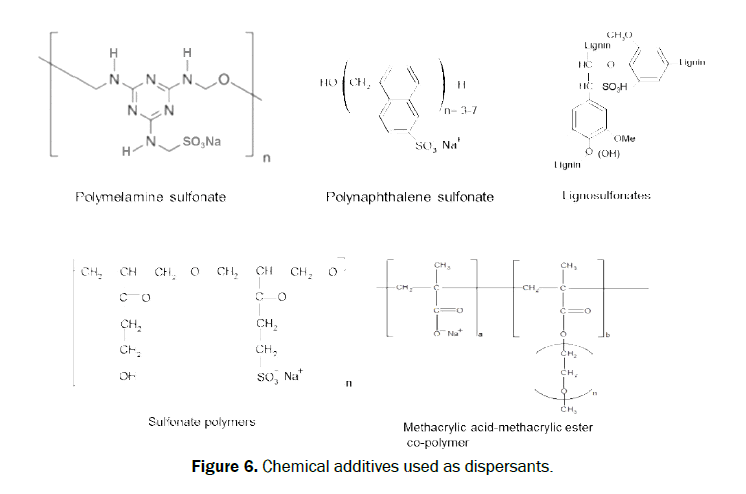 Polypropylene glycol shown in Figure 14 is the most widely used defoamer as it is effective in many systems and also economical. It has to be added to the mix water before mixing other additives to be effective. Silicones are other class of antifoaming agents which are highly effective . They are suspension of finely divided particles of silica dispersed in polydimethylsiloxane or similar silicones. They are very effective regardless of when they are added to the system which is an advantage over polypropylene glycol. Figure 14: Chemical additives used as antifoaming agents. Nylon fibers having lengths of 1” are commonly used fibers to increase cement resistance to the stress associated with perforation and drill collars etc. by transmitting the localized stress more evenly throughout the cement matrix. The optimum concentration of these fibers are in the range of 0.15% to 0.5% BWOC. Particulate rubber added in concentration up to 5% is also used to improve the impact resistance and flexural strength of well cement. Remedial cementing is usually done to mitigate problems that are associated with the primary cement job. The need for remedial cementing is to restore a well from problems aroused due to ineffective primary cementing operational planning and execution. The remedial cementing job is an expensive operation consisting of two broad categories known as squeeze cementing and plug cementing. Similar to primary cementing, remedial cementing also requires as much technical, engineering, and operational experience. It is often carried out when wellbore conditions are unknown or out of control. The expensive rig time and escalating costs spent on remedial job have the influence to affect decision making leading to poor decisions and high risk. Therefore, proper planning and risk assessment is crucial for the success of remedial cementing. Resins based on epoxy type, phenolic type and furans have been used for variety of applications in well construction, completion and production. These are thermosetting free-flowing polymers that can be set to rigid solids. The set time and the compressive strength could be manipulated making it a powerful solution for wellbore issues. Resin have been used for proppant coating and strengthening unconsolidated sands and later extended for the application in cementing. Epoxy resins have been applied also in primary cementing for zonal isolation  as resins have improved compatibility with water based drilling fluid [45,46]. Application of resin cementing for deep water well construction have been explained by Morris et al. . Multiple epoxy groups present in the resin undergo cross-linking reaction with hardeners or accelerators such as amines, alcohols, thiols, etc. The primary factors controlling the rate and extent of cross-linking reaction and the final physical properties of cured resin are temperature, time and exact chemical composition of the epoxy resin and hardeners. 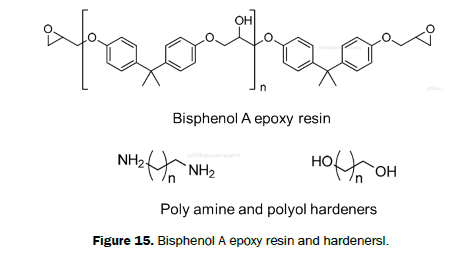 Bisphenol A-based epoxy resins are widely employed, which is activated by hardeners such as poly amines or polyols as shown in Figure 15. Aliphatic epoxy resins as shown in Figure 16 have also been employed for oil field applications . Figure 15: Bisphenol A epoxy resin and hardenersl. 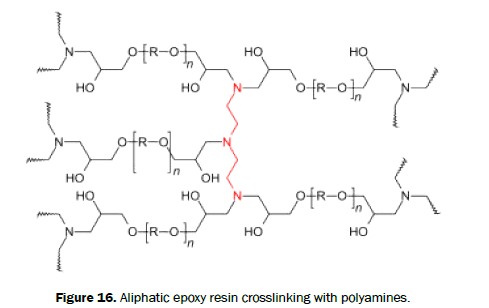 Figure 16: Aliphatic epoxy resin crosslinking with polyamines. Resin squeeze has been used in place of squeeze cementing as remediation for annular pressure build up and water or gas breakthrough as result of poor primary cementing. Squeeze cementing is a dehydration process and the cement slurry is prepared and pumped down a wellbore to the problem area where micro cracks are formed in the cement overtime due to poor primary cementing. The cement slurry is then squeezed into the micro fractures or small voids. This treatment could also be applied for small crack, casing split or large vug, formation rock or another kind of cavity. Therefore, it is critical to have a proper slurry design. In the recent years resins have been used for squeeze jobs due to their better injectivity into micro fractures to control annular pressure build up in casing-casing annulus (CCA) [48-61]. The review article summarizes the different chemicals used in preparation of cement slurry to achieve desired property. The application of retarders and accelerators are discussed with their operating temperature limits as well as their working mechanisms. Different types of extenders have been discussed with details on the advantage against CO2 and sulphate attack. The type of fluid loss control additives and their chemical nature have been discussed in detail. Other additives such as defoamers, lost circulation materials, weighting agents and strengthening agents have been discussed for their importance to be part of the slurry design. Remedial cementing could be avoided by having properly designed primary cementing. Resin squeeze is an effective way to address CCA issues instigated from poor primary cementing. By proper design of cement slurry with right choice of additives and optimal concentration will ensure effective cementing. The authors would like to thank Mr. Timothy Eric Moellendick, the Chief Technologist of Drilling Technology Team, EXPEC ARC, Saudi Aramco for the support. Magarini P, et al. Drilling Design Manual. Eni-Agip Division. 1999; pp: 97-107. Anonymous. American Petroleum Institute (API) Recommended Practice 10B for Testing Well Cements. American Petroleum Institute Washington DC, USA 2014;134. Sauer CW and Landrum WR. Cementing - A Systematic Approach. Journal of petroleum technology, 1985; pp: 2184-2196. Roshan H and Asef MR. Characteristics of Oil Well Cement Slurry Using CMC. Journal of Society of Petroleum Engineers Drilling and Completion SPE 2010;25:328-335. Nelson EB. Well Cementing, Schlumberger Educational Services, Houston 1990. Odler I, et al. On the Combined Effect of Water Soluble Lignosulfonates and Carbonates on Portland Cement and Clinker Pastes - Pt. 1: Physical Properties. Cement and Concrete Research 1978;8:469479. Skalny J and Maycoch JN. Mechanisms of Acceleration by Calcium Chloride: A Review. Journal of Testing and Evaluation. 1975;3:303-311. Joel OF. The Secondary Effects of Ligno sulfonate Cement Retarder on Cement Slurry Properties. Journal of Engineering and Applied Sciences 2009;4:1-7. Traetteberg A, et al. A Study of the Microstructure of Tricalcium Silicate in the Presence of Calcium Chloride. Cement and Concrete Res. 1974;4:203-221. Odler I and Skalny J. Influence of Calcium Chloride on Paste Hydration of Tricalcium Silicate. J Am Ceramic Soc. 1971;54:362-363. Kondo R, et al. Influence of Inorganic Salts on the Hydration of Tricalcium Silicate. J. Appl. Chem. Biotechnol. 1977;27:191-197. Pilhington PE. Pressure Needed to Reduce Microannulus Effect on CBL. Oil and Gas J 1988; pp: 68-74. Singh NB and Abha K. Effect of Calcium Formate on the Hydration of Tricalcium Silicate. Cement and Concreate Research. 1983;13:619-625. Satiyawira B, et al. Effects of Lignosulfonate and Temperature on Compressive Strength of Cement. Proceedings World Geothermal Congress, Bali, Indonesia 2010; pp: 1-3. Brothers E, et al. Synthetic Retarder for High-Strength Cements. SPE/IADC Drilling Conference held in Amsterdam, The Netherlands. 1991;SPE 21976. Bensted J. Retardation of Cement Slurries to 250°F. SPE Offshore Europe held in Aberdeen, UK, 3-6 September, 1991;SPE 23073. Khan B and Ullah M. Effect of a Retarding Admixture on the Setting Time of Cement Pastes in Hot Weather. Journal of King Abdulaziz University Engineering Sciences 2004;15:63-79. Milestone NB. Hydration of Tricalcium Silicate in the Presence of Lignosulphonates. Glucose and Sodium Gluconate. Amer Ceramic Soc 1979;62:321-324. Jennings HM, et al. Interpretation of the Effects of Retarding Admixtures on Pastes of C3S, C3A plus Gypsum and Portland Cement. Proc. Eighth Intl. Cong. Chem. Cement, Rio de Janeiro. 1986; pp: 239-243. Anon. Types of Retarders slurry retarders Cellulose derivatives. 2015. Thomas NL and Birchall JD. The Retarding Action of Sugar on Cement Hydration. Cement and Concrete Research 1983;13:830-842. Bermudez M. Effect of Sugar on the Thickening Time of Cement Slurries SPE Annual Technical Conference and Exhibition. SPE 113024 Anaheim California USA 2007; pp: 11-14. Shell FJ and Wynne RA. Application of Low-Water-Loss Cement Slurries. Paper API 875-12-I. Nelson EB. Well Treating Process and Composition. Canadian Patent No. 1216742. Crump DK and Wilson DA. Set-Retarding Additives for Cement from Aminomethylene phosphonic acid Derivatives. US. Patent No. 4468252. Bett EK. Geothermal Well Cementing Materials and Placement techniques Geothermal Training Programme-Report 2010;10:99-130. Anonymous. Drilling Engineering Lecture Notes on Cementing Institute of Petroleum Engineering. Herriot Watt University 2009; pp: 1-40. Ahmadi SA, et al. The Performance of Foam Cement in Iran Oil Wells and Comparison of Bentonite Light Cement with Foam Cement and Presentation of Foam, Cement Advantages in Iran Oil Wells. Australian Journal of Basic and Applied Sciences 2013;7:696-702. Samsuri A, et al. The utilization of Malaysian Local Bentonite as an Extender and Free water Controller in Oil-Well Cement Technology. Society of Petroleum Engineers Jakarta Indonesia 2009; pp: 1-5. Smith KC and Calvert DG. The use of sea water in well cementing. 2004; Paper SPE 5030. Heinold T, et al. The Effect of Key Cement Additives on the Mechanical Properties of Normal Density Oil and Gas Well Cement Systems. Asia Pacific Oil and Gas Conference and Exhibition Melbourne Australia 2002; pp: 1-12. Lea FM. The Chemistry of Cement and Concrete. 3rd edn. Chemical Publishing Co. Inc., New York, USA 2004; p: 253. Bourgoyne AT, et al. Applied Drilling Engineering. Society of Petroleum Textbook Series 1986; pp: 85-111. Anonymous. Cement Slurry Weighting Agents. 2015. Salim PA. Special Considerations in Cementing High Pressure High Temperature. Wells International Journal of Engineering and Applied Sciences 2013;1:120-143. Adams N and Charrier T. Drilling Engineering: A Complete Well Planning Approach. Penn Well Publishing Company, Tulsa, Oklahoma, USA 1985; pp: 297-303. Mollah MAA, et al. Adv Cem Res. 2000;12:153. Stiles DA. Successful Cementing in Areas Prone to Shallow Saltwater Flows in Deep-Water Gulf of Mexico. OTC 8305, OTC 1997; pp: 5-8. Mosquet M, et al. Seventh CANMET/ACI, Berlin ACI SP-217 2003; pp: 161-175. Michaux M, et al. Chemistry and Characterization of Portland Cement. In: Well Cementing. EB Nelson Elsevier Science Publishers, Amsterdam 1990; pp: 8-25. Nguyen JP. Oil and Gas Field Development Techniques. Institut Francais du Petrole Editions. Techno Paris Francis 1996; pp: 187-192. Lake LW and Mitchell RF. Petroleum Engineering Handbook. Drilling Engineering, Society of Petroleum Engineers 2006;2:395-410. Phipps JS, et al. Design and Evaluation of an Elastomeric Sealant for Use in Primary Cementing. International Symposium on Oilfield Chemistry, 28 February-2 March, Houston, Texas, USA. SPE-106207-MS.
Al-Ansari AA. Thermal Activated Resin to Avoid Pressure Build-up in Casing-Casing Annulus (CCA). SPE Offshore Europe Conference and Exhibition, 2014; pp: 8-11. Morris K, et al. Resin-Based Cement Alternatives for Deepwater Well Construction. SPE Deepwater Drilling and Completions Conference, 20-21 June, Galveston, Texas, USA. SPE-155613-MS.
Al-Yami AS, et al. Development of New Retarder Systems to Mitigate Differential Cement Setting in Long Deep Liners. Middle East Drilling Technology Conference and Exhibition, Cairo, Egypt. SPE/IADC 2007;107538. Anonymous. J Well Engineering Shell Intensive Training Program 2014; pp: 1-46. Bensted J. Effect of Accelerator Additives on the Early Hydration of Portland Cement. Cemento. 1978;1:13-20. Cowan KM and Eoff L. Surfactants: Additives to Improve the Performance Properties of Cements, Society of Petroleum Engineers. International Symposium on Oilfield Chemistry New Orleans LA. USA 1993; pp: 317-327. Edwards GC and Angstadt RI. The Effect of Some Soluble Inorganic Admixtures on the Early Hydration of Portland Cement. J Appl Chem 2010;16:166-168. Huwel J, et al. Crest Pumping Technologies Cement Compressive Strength Development Drastically Affected by Testing Procedure. Proceedings of American Association of Drilling Engineers Fluid Conference and Exhibition, Houston, Texas, USA, 2014; pp: 1-5. Mueller DT and Bray WS. Characterization of Surfactant-Enhanced Cement Fluid-Loss Additives Proceedings of Production Operations Symposium. Oklahoma City, OK, USA, 1993; pp: 321-334. Nguyen PD, et al. Stabilizing Wellbores in Unconsolidated, Clay-Laden Formations. SPE International Symposium and Exhibition on Formation Damage Control, Lafayette, Louisiana, USA, 2004; pp: 18-20. Pauri M, et al. Effect of Triethanolamine on the Tricalcium Silicaite Hydration. Proc. Eighth Intl. Cong. Chem. Cement. Rio de Janeiro 1986;3:125-129. Ramachandran VS. Action of Triethanolamine on the hydration of tricalcium aluminate. Cement and Concrete Research 1973;3:41-54. Ramachandran VS. Calcium chloride on concreate. Applied Science Publishers. Englewood. NJ 1972; pp: 216. Salam KK, et al. Evaluation of Thickening Time of Oil Field Class G Cement Slurry at High Temperature and Pressure using Experimental Design International. Journal of Engineering Sciences 2013;2:361-367. Shadizadeh SR, et al. Experimental Investigation of Silica Fume as a Cement Extender for Liner Cementing in Iranian Oil/Gas Wells. Iranian Journal of Chemical Engineering 2010;7:42-66. Shuker MT, et al. Laboratory Investigation on Performance of Cement Using Different Additives Schemes to Improve Early Age Compressive Strength Research. Journal of Applied Sciences Engineering and Technology 2014;7:2298-2305. Wasnik A, et al. Application of Resin System for Sand Consolidation, Mud-Loss Control and Channel Repairing. SPE International Thermal Operations and Heavy Oil Symposium, Calgary, Alberta, Canada, 1-3 November. 2005;SPE-97771-MS.